All components supports both local and remote data binding, have fully customizable appearance, animations, themes and much more. A suite of 27+ advanced .NET User Interface controls. 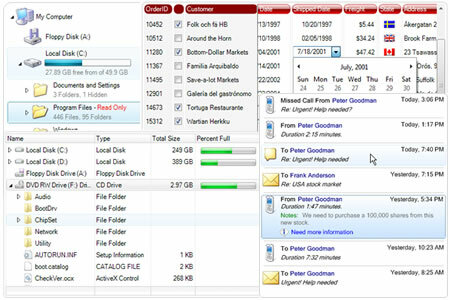 The package includes docking and tabbed document management controls, advanced data visualization controls, multiple containers which can contain custom controls and components for grouping and organizing your application layout. All components are easy to use, have custom appearance, mutiple styles, supports XML load/save and fast data loading time. All controls have built-in live editor, advanced drag and drop, sorting and filtering, fully customizable appearance and theme support. Add the combined power of TreeView and ListView controls to your applications. Display your hierarchical structure with more details added by fully customizable columns. Using HTML tags arrange your data in custom layouts in every column, node and subitem. A custom feature rich control for .NET windows forms. It allows you to create rich hierarchical structure of your data with ability to include in each tree node different objects like text, images, check boxes, hyperlinks and custom controls, arranged in custom layouts. It is a high performance control, with advanced filtering and custom sort operations. 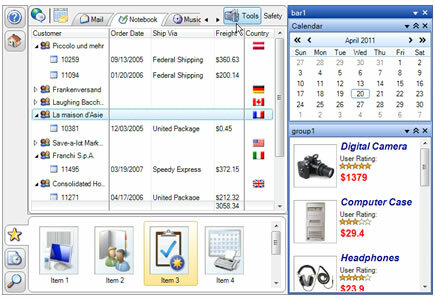 IntegralUI TabControl is advanced control which has an option to merge a set of tabs and a toolbar in single line. 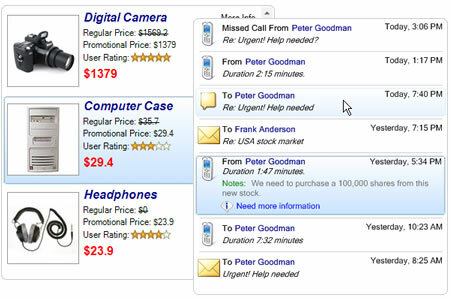 In this way, allowing you to use the same tools for every visible page. There are many options to change appearance of tabs. 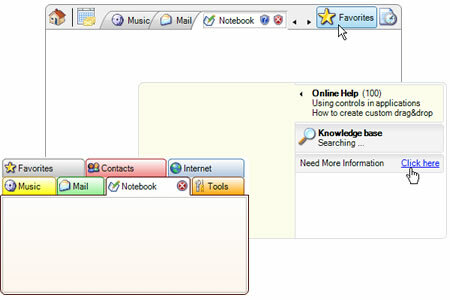 The toolbar can contain items like: buttons, labels and separators on left and right side of the tab strip. The control is easy to use and very customizable with plenty of options for changing the overall appearance. 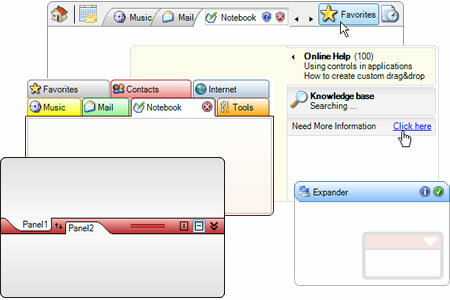 There is support for themes: Classic, XP and Vista. A control packed with plenty of options for display, selection and sorting of data. It has five different views to display items (Details, Large Icon, Small Icon, List and Card View) and advanced Drag&Drop support. Use various HTML Tags to enhance your user interface. 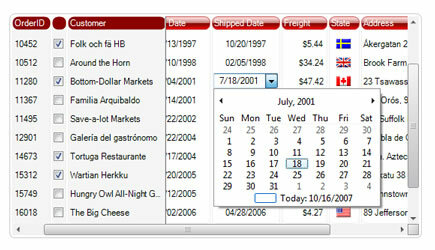 A control with plenty options for display, selection and sorting of data and item collections. With it you can customize the presentation of data like never before. 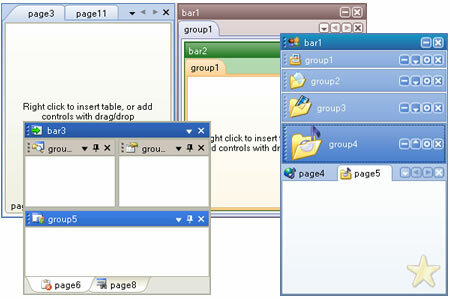 Table formatting is present and WordWrap. All of this gives you more flexibility in creation of custom user interface. Bring a new level of user interaction with your applications using advanced docking windows and tabbed documents management solution. Experience the unparalleled support for Windows XP Themes and color schemes and the most precise emulation of Office 2003, Visual Studio .NET 2003 and Visual Studio 2005 look and feel.